The Forbidden Mazes of the Jennerak: Jenner-what? Mazes is intended to be an old school role playing blog. I took the title from an old movie I always loved from the eighties--I think it was Tom Hanks first big role. The movie was Mazes and Monsters from the book by Rona Jaffe. The movie attempts to portray D&D in a very negative light but aside from that, it's works on a good B-Movie level. It's is corny, over acted, and about thirty minutes too long but it has some really cool maps and monsters in it--like the reptillian Gorvil. 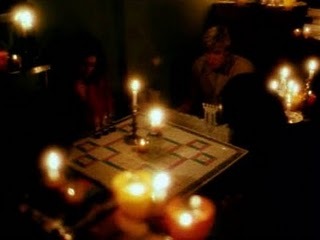 My favorite scenes are the ones where the group is playing Mazes and Monsters and in one of these sessions a map is shown that the Maze Controller calls The Forbidden Mazes of the Jennerak". The Jennerak, he relates, are "a mutated people, once human, now unspeakably vicious." The lost civilization of the Jennerak are only one idea I took from the film's fictional game and incorporated into my D&D setting. I also created a playing surface like the one in the movie by painting a large piece of cardboard, marking it off in one inch squares , and covering it with a large sheet of plexi-glass we can draw scenery on with dry erase...we've had some awesome games using that surface. "Okay...make a saving throw versus goofiness."